Shazam! (2019) is the latest superhero flick by Warner Bros. and the DC Universe, this time telling the origin story of a lesser known here named Shazam. 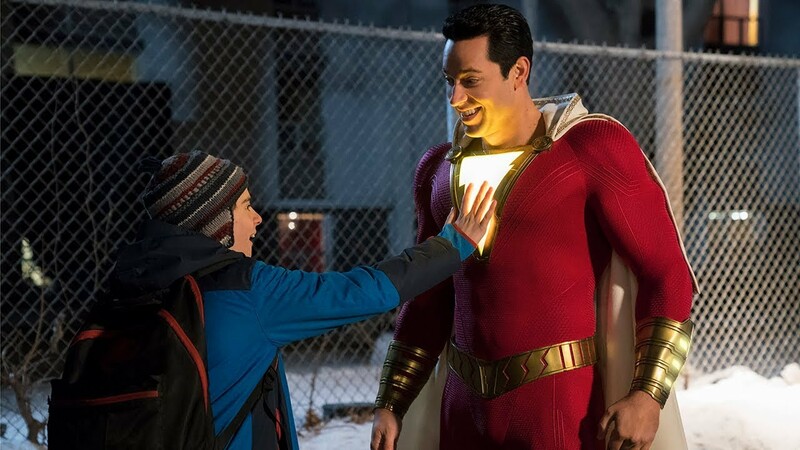 Directed by horror director David Sandberg (Lights Out, Annabelle: Creation), this film stars Zachary Levi as Billy Batson, a 14-year-old foster kid who inherits the powers of the wizard named Shazam. With these powers, he has to learn his true potential in order to defeat the seven deadly sins trapped in the body of Dr. Thaddeus Sivana (played by Mark Strong). This review is able to come out early as I am a Cineworld Unlimited Card holder and got to go to the advanced screening of Shazam! which took place last night. I was one of the people that was beyond excited to see Zachary Levi cast in this particular role. Having loved him in projects such as Tangled and the Broadway show She Loves Me, I had seen him do interviews and host events at SDCC and be an absolute joy. He was truly the perfect fit for the role, and it can be clearly seen throughout the film. He is captivating to watch on the big screen and truly acts like a 14-year-old in a superhero's body. He has a great sense of comedic timing, and his genuine and fun personality in real life has certainly helped promotion for this film. The other clear star of this film is Mark Strong, someone who I have loved seeing recently in the two Kingsman films. Here though, he has a completely different personality. Sivana is a well fleshed out character here, and is also truly menacing. This is one of the strongest villains I have seen in a while, where I can understand the development of a character, feel some sympathy for what they are feeling but also see how destructive and awful they truly can be. What helps Levi and Strong give these performance is how their characters have been written. The origin story I found to be quite simple, but I liked how small and basic it seemed. It meant that we could actually focus on the development of these characters, and particularly focus on the relationship between them and the people around them, as well as watch them both realise their full potential. For the two hour run time, you feel like you are also on a journey with Billy Batson and his time being Shazam. This film, just like with a majority of superhero films, does have some faults though. Coincidentally, I found it to have very similar issues as another comic book film I saw this month, Captain Marvel. Shazam! suffers from a very slow start, and the opening sequence, whilst establishing and fleshing out the villain, almost felt cheesy and badly paced. As well as that, I felt that there is a weird blend of tones that this film tries to go for. I can see Sandberg's horror influence mixed in here, with some incredibly dark and scary scenes involving Sivana. However, for this film being advertised as completely family friendly, I am worried that these dark tones (which are done excellently) may end up being too dark for some children. I also found that the dark tones and the lighthearted tones of Zachary Levi's Shazam do not blend as well as they potentially could, and it almost feels as if it could be two different films at some point. When they do blend though, it is very well executed. I will not spoil anything in particular, but this film also has a lot of fun in terms of easter eggs and references, both from the DCEU and outside of the DCEU. This film makes it aware of what film everyone has compared it to, and it plays on that particular moment brilliantly (you will know exactly what I mean when you see it yourself). The very last moment of the main film is also brilliant, and will leave you gasping that they actually did what they did. This is so far the strongest film released by DC in the past decade. They finally realise that they can have fun with the idea of superheroes and it works particularly well for the character of Shazam. Zachary Levi and Mark Strong hold the movie together, even when it feels rocky in the tone and basic in the story. With the success of this film alongside Aquaman, DC has finally gotten back on track. Have you been lucky enough to see an early screening of Shazam!, and if so what did you think of it? If you couldn't make it, are you excited to see it when it releases on April 5th? Let me know in the comments below, let's have a conversation!